Montgomery County Commissioner Joseph C. Gale at the first meeting of the Montgomery County Commission in 2017 . The final board meeting for Josh Shapiro, who will leave to become the state's attorney general. Among his colleagues on the Montgomery County Commission, Joseph C. Gale stands out. He is the only Republican on the board that oversees a $409.5 million budget in one of the state's wealthiest counties. He is a first-time officeholder. He considers himself a fiscal conservative. And - as was clear as he marked the start of his second year in office last week by complaining that he has been shut out of county government - he does not get along with his Democratic colleagues, and not so well with members of his own party, for that matter. Then there's his age: Gale is 27. He lives with his parents in Plymouth Meeting and ran for county commissioner in 2015 without the backing of the county GOP. Since taking office, he has not been afraid to speak out against Democratic Commissioners Valerie Arkoosh and Josh Shapiro, who is about to become the state's attorney general. They say his accusations amount to nothing more than political grandstanding and have, in turn, accused him of not participating in county government. But Gale, who holds up President-elect Donald Trump as a role model, says he is not in Norristown to get along with everyone. "A lot of times if it seems I'm upsetting the administration, I'm doing my job," he said. 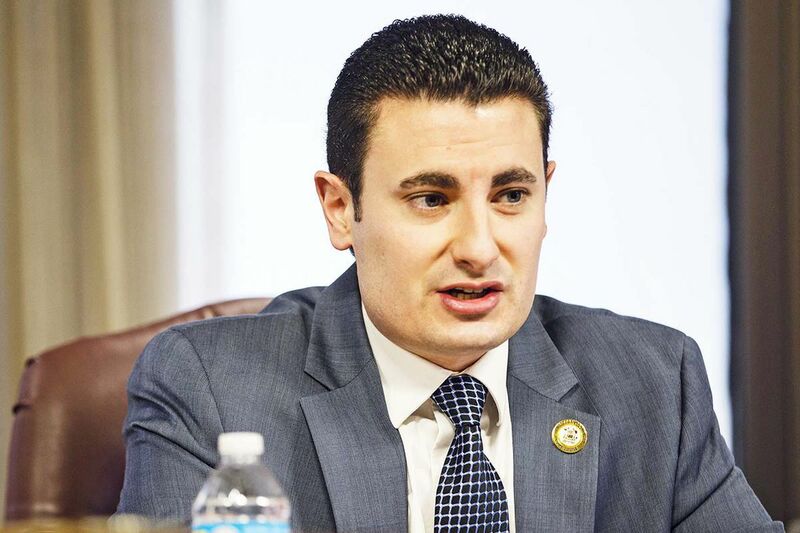 A graduate of Plymouth Whitemarsh High School and Temple University, Gale said he has been attending local government meetings since he was about 16 and a teacher encouraged him to get involved in politics. At age 20, Gale ran for Plymouth Township council. He lost, but he said he learned how to knock on doors and talk to people. After graduating from Temple with a degree in finance and real estate, he worked for the county recorder of deeds office for a year before getting a job as a loan specialist with a home-building company. He left that job to run for commissioner. During that 2015 campaign, the Republican Party chairman at the time called him a "liar" and a committeeman told him, "I'd like to slice your throat." But he defeated a fellow Republican in the general election to become the county's minority commissioner. The law requires that the board have at least one Democrat and one Republican. Now, Gale, said he keeps his party "at arm's length." Bill Donnelly, who became county party chairman after the 2015 election splintered the party, said he's "perfectly happy" with Gale. As for whether Gale would receive an endorsement in the future, "that's up to the 800-some committee people," Donnelly said. "They have to decide who they're supporting." During his campaign, Gale promised to fight tax and fee increases and make government work better, and he says he's done a good job. He voted against a $5 annual vehicle registration fee that will go toward bridge and road repairs. He voted against the 2017 county budget that raised the county portion of real estate taxes 11 percent. Last week, he voted against several appointments to county committees and boards because he said he did not learn of them in advance. But Gale is essentially powerless. His two Democratic colleagues do not need his vote to get things done. And, they say, many of his complaints stem from not engaging with the government process, outside of public meetings. Arkoosh, the chairwoman of the county commission, said Gale rarely asks questions of county staff members, and instead raises his concerns for the first time at a meeting where an item is scheduled for a vote. "The most difficult thing has been that he makes statements about not having been given information about a topic," Arkoosh said. "The challenge of that is that there's no way for the staff or the other commissioners to know what he doesn't know." Gale's approach has led to contentious meetings and created tension among the commissioners. The acrimony has continued in briefings with reporters after meetings, which in recent months have often been even more tense than the public meetings. The county commission has long experience with acrimony - Republican James R. Matthews and Democrat Joseph M. Hoeffel forged an alliance to keep Republican Bruce L. Castor Jr. out of county government decisions in 2008, resulting in four years of public name-calling and infighting. But the Democrats who took control of county government in 2012 got along with Castor, who remained the minority commissioner until last year. Castor even came to the defense of Arkoosh and Shapiro last fall, after Gale accused them and the county's senior staff members of shutting him out. "I witnessed no 'politics,' backroom or otherwise," Castor wrote in an op-ed in the Norristown Times Herald in September. "We were there to make government managerial decisions." Gale has dismissed Castor as a "lapdog" who got along with the Democrats for his own benefit. As Shapiro steps down this month to become state attorney general and the county judges appoint a new commissioner, Arkoosh said she hopes "that Commissioner Gale decides to check politics at the door ... and govern collaboratively in a participatory way." Gale, meanwhile, says his lack of interest in becoming part of the political establishment aligns with Trump's approach. He says that he was the first Pennsylvania elected official to endorse Trump, and he ran his own radio advertisements promoting his candidacy and celebrating his victory. "We were both outsiders, we challenged the establishment, went against the will of political party bosses and connected with the people in a grassroots fashion," Gale said. "And we were both successful."